Best FH in the world at the moment? Thread: Best FH in the world at the moment? I think this OP is just a TROLL topic. Ridiculously dumb! Ahhh I know I should not feed the troll .. but wth, here come eat it. Game developed to make ability to use both BH and FH quickly. One thing I remember from Kreanga he said was that no matter how powerful his BH loop drive was, he always looked to follow and finish with FH... because FH is always more dynamic and powerful. Well der echte you can see it vs choppers. Even Karakasevic and Kreanga run to the forehand mostly vs choppers. Also Schlager! [...] Table tennis is a complicated sport where most of the secrets are revealed only when you are at the same/similar level and stand on the other side of the table ... for the rest of us mere mortals its an exercise in futility. Maybe you meant it the other way TTMonster, but I find this idea quite upsetting to be honest with you : ) I mean if I was a total layman, didn't play the game and barely watch it, it might be true. But if I'm being involved, practice once or twice a week and watch most of the tournaments on a regular basis - can't agree here. Of course I never faced Ma Long and there's a big chance I never will, but I had a taste of what o proper shot looks like and what it takes to execute it properly. I've seen Ma playing against the number of opponents. The rest is my (or should I say ours) modelling, approximation and imagination. And isn't this how the world works? Isn't it i.e. how the science is done in some sense? Might superficially agree here ; ) But this is exactly why I prefer Asian or Chinese philosophy of this particular stroke, than Euro/Jap style. The latter one relies too much on the rubber ability to generate spin and speed. Asian style is more physically demanding, but leaves you more room for a variety. It's like a difference between automatic and manual transmission. I have a suspicion that someone (probably working for CNT or JNT) does have some hard analytics data to quantify it in terms of speed/spin/error %/FH win % or something similar, but this is not readily available, right? And if we don't, then it's just arguing whether green color is 'better' than blue, or perhaps that C. Ronaldo is 'better' than Messi (I don't have opinion on either question). Last edited by jawien; 12-11-2018 at 12:40 AM. Now, read the whole paragraph that I wrote , I was not talking about form at all, I was talking about the trajectory of the ball ... what I meant is just because Xu Xin takes the ball late and most of his forehands have enticing sidespins on it does not mean he has the best FH and also to take into account that FH is Xu Xin's most dominant shot .. so he is going to win most of his points using Forehand .. which also will create a bias in the watcher's brain ... "this guy wins all his points with Forehand and it looks so beautiful" ... thats what I was warning against .. I don't have anything against trying to copy the most beautiful shot there is in the game ... as you said when you don't have the resources you inspire yourself by copying your favorite player .. and there is nothing wrong in it .. but eventually you have to figure out what works for you .. well thats another topic. Last edited by ttmonster; 12-11-2018 at 01:17 AM. Well... it wasn't his FH in that WCTT 2003 final against Joo Se Hyuk, in which Herr Doktor Werner took the crown, that stood out for me. I was actually impressed by his ability to BH-loop lethally against such deep chops, and the extremity of his technique in doing so. Last edited by yoass; 12-11-2018 at 01:59 PM. Thanks for the reply, sorry if I wont be able to address all the topics probably. Yeah, writing that the stats would always be incomplete in some sense, maybe I took too much of a "philosophical" approach here. In practice those stats you mentioned might give you quite a good idea about somebody's strength on the fh wing. What I was aiming at was more related to your Federer - Del Potro comparison. When Federer was becoming a superstar many people described his game as a quite normal one, but for some reason he was doing all those shots just a little better than his opponents. Del Potro has more power, but does he has Federer's variety and accuracy? If your fh power relies on the body movement, than you have more space for creativity, rubber is not so reactive, so it's easier to play more accurate, change directions, have better and unpredictable ball placement. This is why my vote would go to Ma Long, because he is the crown jewel of the Chinese style. LGL was once asked how he compares ML to ZJK and (I think he was talking about their fh techniques) his comparison was that "if Zhang Jike understands like 6-7 different spins then Ma can understand about 8 ...). I think you can take it both ways, that they could produce those spins and deal with opponents balls in the same manner. Last edited by jawien; 12-11-2018 at 12:46 PM. Different players have different forehands which means they will work better Vs different people. The best forehand off the bounce attacker is different than the best forehand power looper vs attackers or forehand Vs defenders etc. It's complicated but we know the answer isn't some obscure lowly ranked player because they wouldn't be lowly ranked. If one evaluates all the forehand functions, including playing over the table, the answer would be Ma Long. Mr. Fan ZD is not strong over the table with his forehand because of his great commitment to his unbelievable backhand play over the table, to the neglect of his forehand development in this aspect of play dynamics. One may legitimately argue that Ma Long leads table tennis history in forehand dominant, forehand point winning demonstrated capabilities. The Dictator. Xu Xin has monstrous FH, with such quality, that only the very top players can deal with it. He has the most powerful FH. Ryu Seung Min, ZJK and Wang Liqin doesn't play internationally, so they are out. Ma Long and FZD are the second bests. 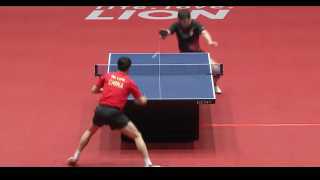 Harimoto and Timo Boll and good contenders with their over the table counterloops. Yes, Harimoto might prefer to use blocks to distract the opponent or because he can't connect BH to FH so close to the table, but when he chooses to counterloop it has quality only a few can match. He has the best FH? No, but one of the if not the best close to table counterloop. Liu Dingshuo a bit inconsistent, but also have monstrous FH alongside LJK. After these players and some other CNT members whom I am lazy to count, Oshima Yuya, Hugo Calderano and Jang Woojin are the bests. Right now ma long, next Hugo calderano....look a match against fan zen. in last ittf tour. Fan outclassed by Hugo both in speed and placement. Harimoto best with flick, counter drive and block with awkward placement, very difficult to read.